The style of the 1970s has been working its way back into fashion for some time now, and 2017 was the year it took over the trends. Everything from the decade seems to be the epitome of style right now. 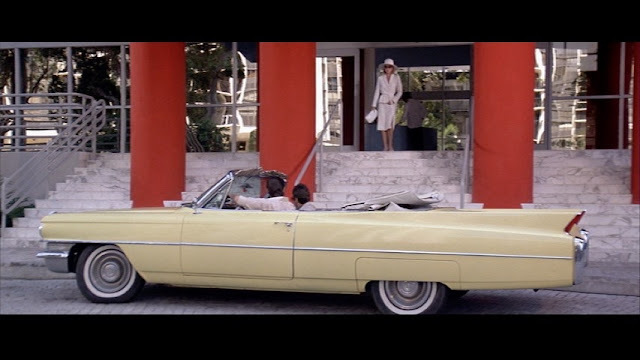 One example is all the menswear that has been popular throughout the year - appropriate considering this is the 40th anniversary of Annie Hall and the iconic style of Diane Keaton. Of course another style star from the decade is Ali MacGraw, someone who is always mentioned in the fall and winter months due to the coat inspiration of 1970's Love Story. Both are among The Style Essentials here on GlamAmor. This year also brought back the popularity of disco dresses - slinky, sparkly, or sometimes both. 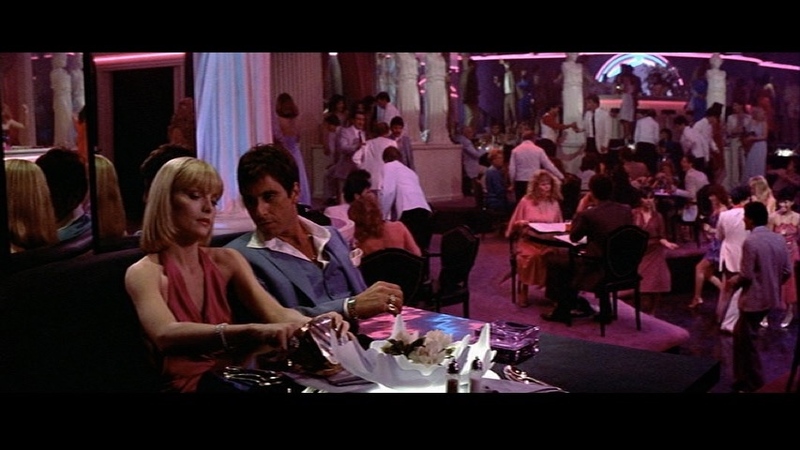 For this type of look, few movies serve it up better than yet another Style Essential - 1983's Scarface. The first part of any decade carries over the style of the decade before, and the early 80s was largely an extension of 1970s style. During this time, fashion began turning to earlier eras for inspiration, especially the look of the 1930s (as the 1980s went on, there was more of the 1940s with its suiting and shoulder pads). Designers like Halston and Yves Saint Laurent loved to refer to the masters of Old Hollywood - costume designers like Adrian who was responsible for most of Jean Harlow's bias cut, body conscious silk gowns. 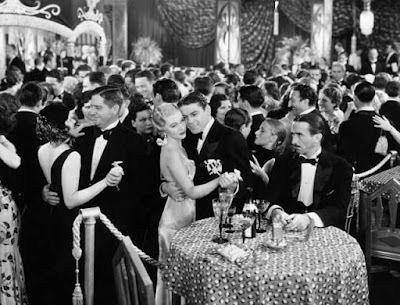 The connection to 1930s classic cinema does not end there. 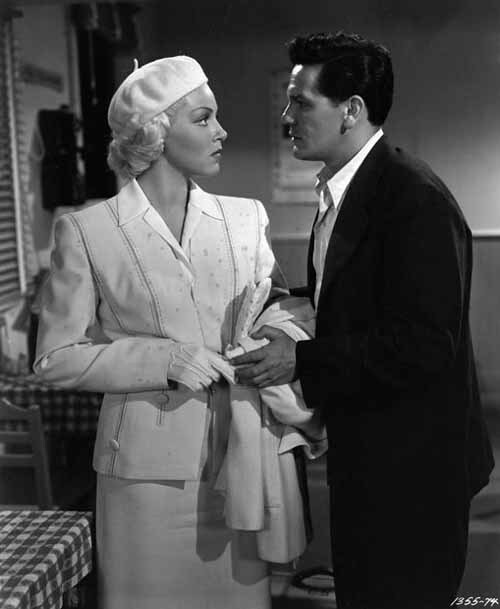 Scarface, of course, is a remake of the Howard Hawks' movie from 1932 - director Brian De Palma even dedicated his film to Hawks and screenwriter Ben Hecht. Because the original was done during the time when the Production Code was still taking effect, the film had few restrictions on it. The story was loosely based on Al Capone (whose nickname was "Scarface") and Hawks did not shy away from the violence of his life. 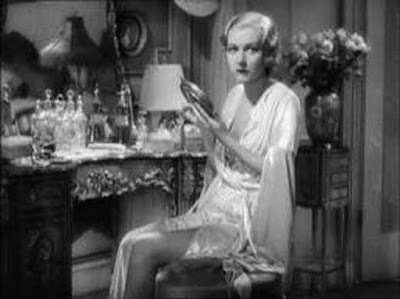 In addition, the Pre-Code era costumes could also be as revealing as they wanted, and Karen Morley's Poppy was certainly sultry as the gangster's girl. The 1983 version of Scarface was widely criticized when it first premiered, namely for its own depiction of violence, but has since been re-evaluated and now considered one of the best gangster movies of all time. Al Pacino stars as Tony Montana, a Cuban refugee who starts in America with nothing and works his way through the criminal ranks to becoming a powerful drug lord. 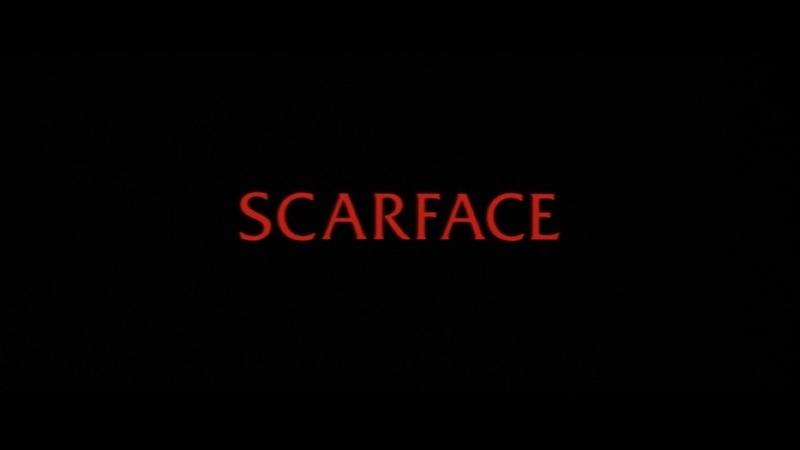 Pacino is perfection; his physicality alone tells the story of this man's rise and fall, and he seems to regress to an almost animal state by the end of the film. 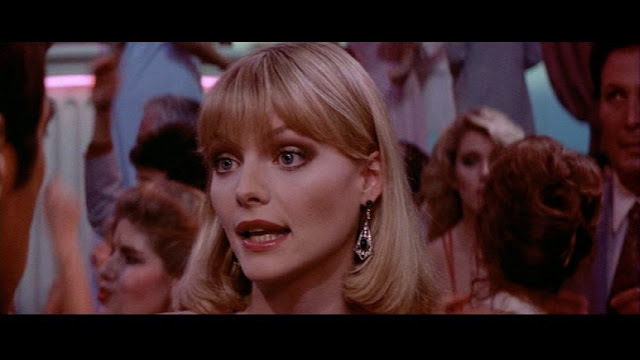 Another of the cast who is absolute perfection is Michelle Pfeiffer. 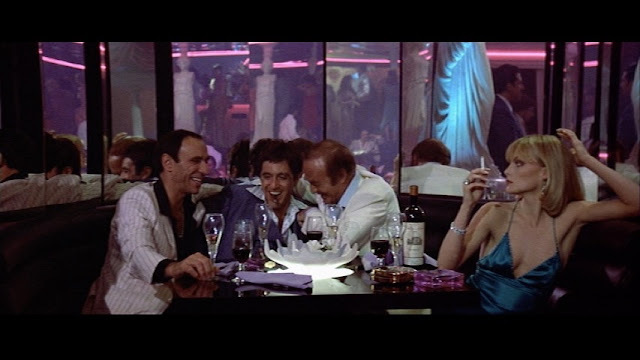 Elvira Hancock is a woman who goes from being the girlfriend of one gangster (Robert Loggia) to the wife of another when Tony takes over the drug business. This is Michelle very early in her career, and it's said that people - including Pacino - were not in favor of her being cast. Glenn Close was apparently the front runner with others like Geena Davis, Sharon Stone, Sigourney Weaver, and even Carrie Fisher being considered instead. Today it's hard to imagine anyone else in the role. She inhabits Elvira perfectly, including her always annoyed attitude and her slight frame communicating the character's love of cocaine. 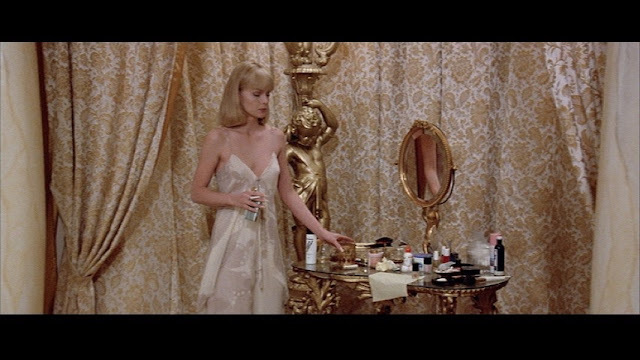 Everything about her style - from the hair to the clothes - has become influential in fashion, and that is courtesy of costume designer Patricia Norris. Though many costume designers in early Hollywood came from couture, Norris was self-made and had her own path. The single mother worked odd jobs to care for her 5 children, and eventually found work in the stockroom of the costuming department at MGM. She then progressed to being a costumer and ultimately a costume designer known for her rigorous research and historical knowledge of everything from architecture to fashion. Unlike the early days of Hollywood with their long-term contracts, modern costume designers were not necessarily aligned with a studio. Instead they often had ongoing collaborations with directors. This describes Norris, who had a long-time collaboration with David Lynch and partnered with him on productions like The Elephant Man, Twin Peaks, and Blue Velvet. Something extra special about Norris is that she was also a production designer, which means that she really was responsible for the whole look of Lynch's work. 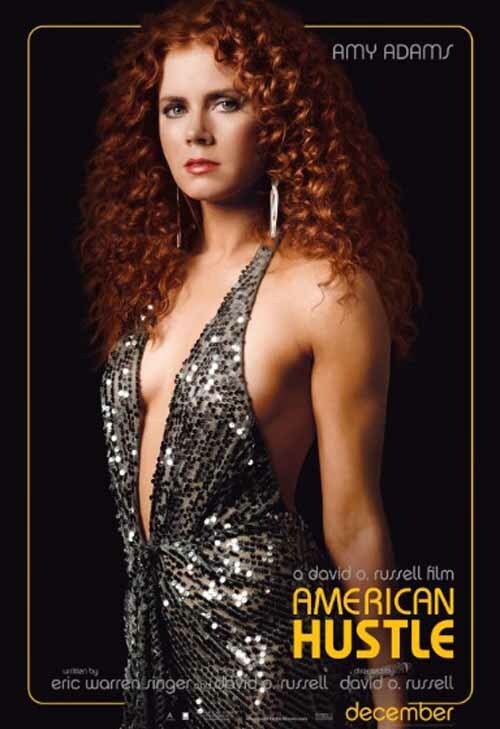 She was so talented in this regard that she is the only person who has ever received the Lifetime Achievement Award from both the Costume Designers Guild and Art Directors Guild. 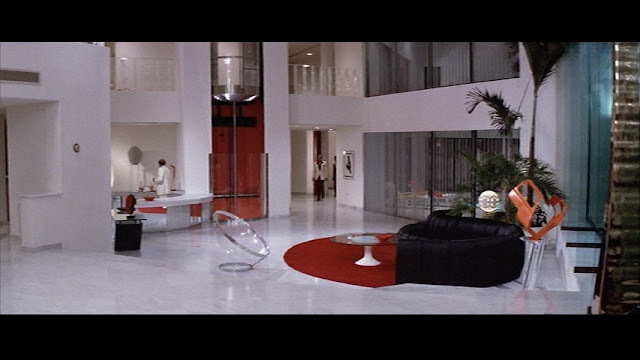 She could design for comedy as well as drama, and worked with some of the best directors of the genre like Mel Brooks (High Anxiety, Silent Movie) and Blake Edwards (Victor/Victoria). As a costume designer, she would be nominated 6 times for an Academy Award - including for The Elephant Man and Victor/Victoria - before she passed away in 2015. Even with these credentials, Patricia was humble and gave credit for the longevity of the costumes in Scarface to Michelle Pfeiffer as well as the producers and director. She insisted, "They knew exactly what they wanted." 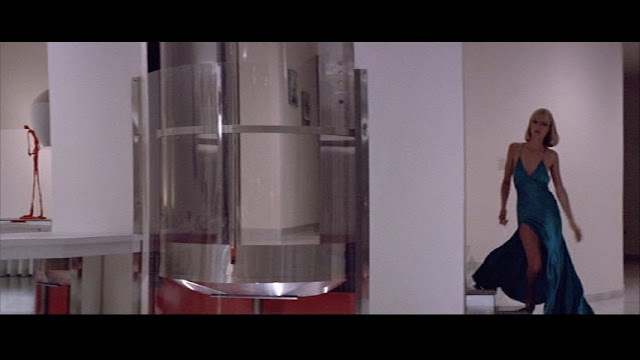 De Palma was a student of classic cinema and made frequent references to it in his work. What's really interesting is that we can see those references in the costume design as well. The original Scarface gave him a great starting point for what Tony's girl should look like. 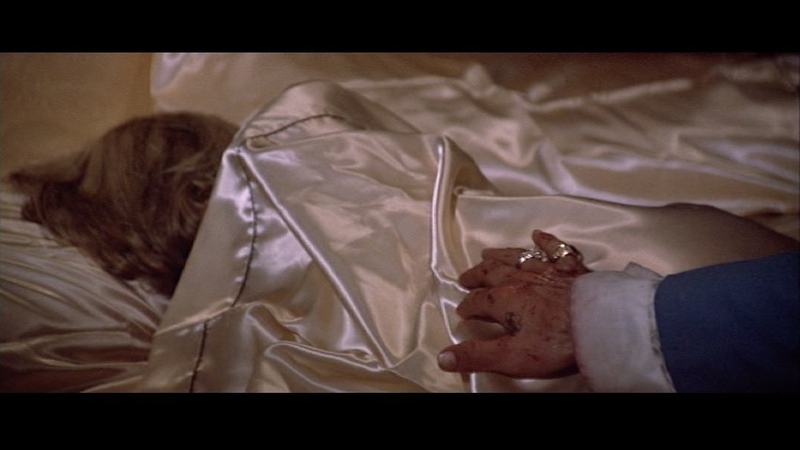 Elvira's silk bias cut gowns are also a nod to someone like Jean Harlow, who herself played a gangster's moll in 1931's The Public Enemy. 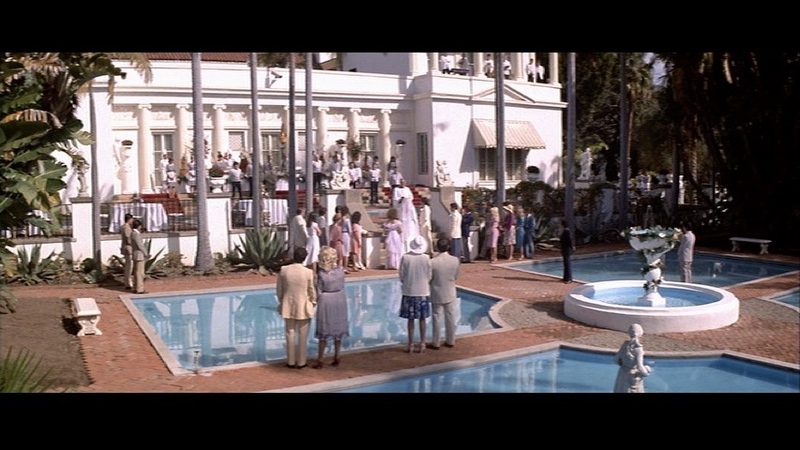 In addition, there is another nod to 1946's The Postman Always Rings Twice with Elvira's all white suit. 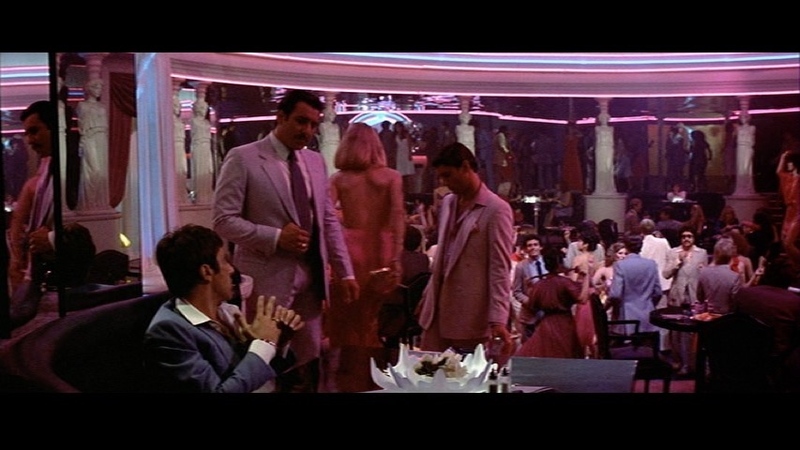 Scarface has been a source of inspiration for the fashion industry for several years. Armani, Versace, and Donna Karan have all taken cues from the costumes for their designs, and many can be seen on the red carpet. Rihanna is such a big fan of the film that she asked Armani for not one but two custom creations for her appearances at the Grammys and London's Fashion Week. The plunging necklines and thigh high slits have also appeared at many an award show, including the Golden Globes and Oscars. They're so common now, it's almost expected. And as I mentioned in the opening, disco was a trend on the 2017 runways with designers ranging from Versace to Michael Kors all offering up options. Because 1970s style is so huge this year, even Halloween costumes reflected the decade. Cindy Crawford's model daughter Kaia channeled Elvira right down to her blonde wig. You'll see some of these Cinema Connections below. It's easy to assume that Scarface will be an influence in party dresses for the upcoming holidays as well. 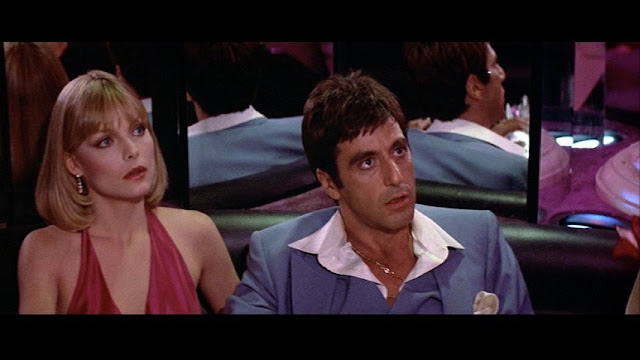 Scarface can give us plenty of inspiration for 2018. Just remember, my friends - the world is yours. Money + Marriage = Happily ever after? Colker, Dave. "Patricia Norris Dies at 83: Oscar-Nominated Costume Designer." The Los Angeles Times, March 6, 2015, http://www.latimes.com/local/obituaries/la-me-patricia-norris-20150307-story.html. Norris, Patrick. "A Tribute to Patricia Norris, 1931 - 2015." Costume Designers Guild, publish date unknown, http://costumedesignersguild.com/articles-videos/articles-archive/patricia-norris-tribute. R, Nathaniel. 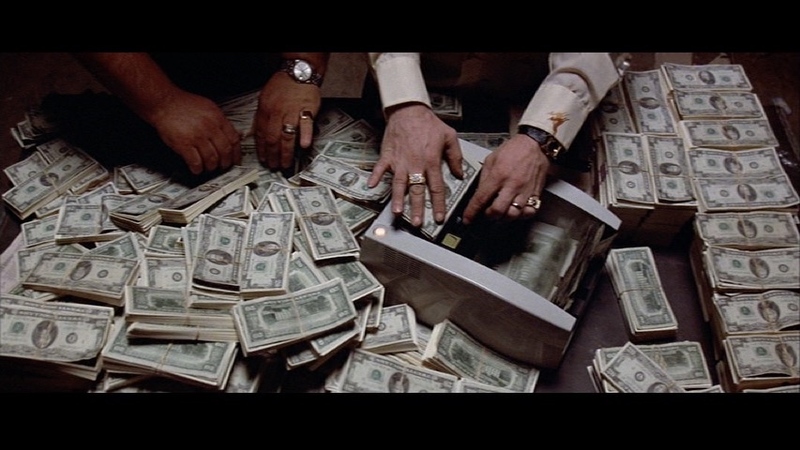 "Interview: Patricia Norris on 12 Years a Slave, Scarface, Twin Peaks." The Film Experience, February 25, 2014, http://thefilmexperience.net/blog/2014/2/25/interview-patricia-norris-on-12-years-a-slave-scarface-twin.html. Saperstein, Pat. 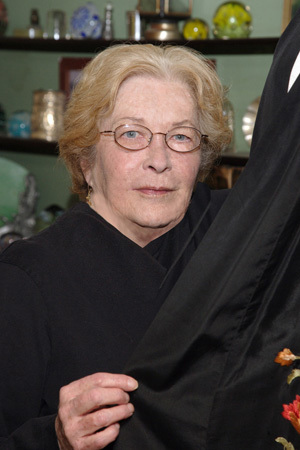 "Costume Designer Patricia Norris Dies at 83." 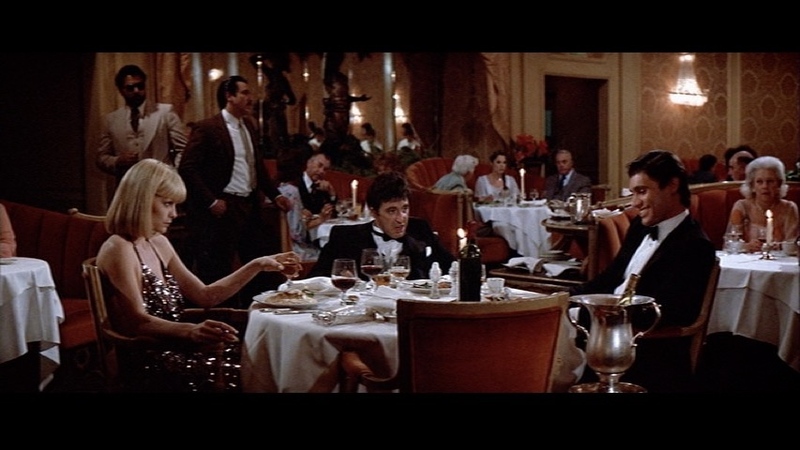 Variety, March 4, 2015, http://variety.com/2015/film/news/costume-designer-patricia-norris-dies-dead-scarface-at-83-1201446183/. 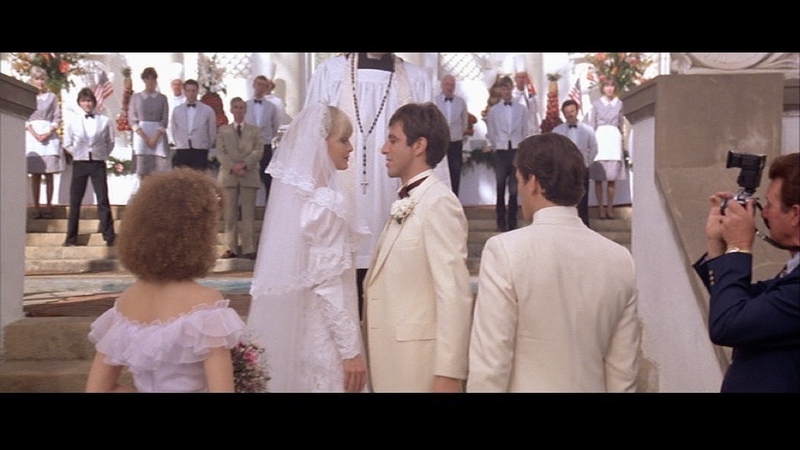 It was fascinating to see the style connection between the original film and the 1983 version. I wasn't familiar with Patricia Norris' career, so it was good to learn more about her. Ill be paying closer attention the next time I see her name in the credits.